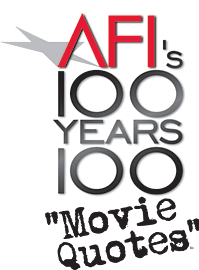 Part of the AFI 100 Years... series, AFI's 100 Years... 100 Movie Quotes is a list of the top 100 movie quotations in American cinema. The American Film Institute revealed the list on June 21, 2005. Casablanca has by far the most entries on the list, with six. The two runners-up, Gone with the Wind and The Wizard of Oz, each have three entries. Humphrey Bogart is way out in front among represented actors on the list, with five entries. No other performer has more than three. His character Rick Blaine from Casablanca delivered four of those five quotes, making him the most prolific character on the list, again by a wide margin; no other character has more than two entries on the list, sometimes in multiple films. The five-way tie for second place among actors includes two women: Bette Davis and Vivien Leigh. (Marlon Brando, Tom Hanks, and Al Pacino round out the runners-up.) Two of Leigh's three quotes are spoken by her character Scarlett O'Hara from Gone with the Wind. She, Dorothy Gale from The Wizard of Oz, and Norma Desmond from Sunset Boulevard are the only female characters quoted more than once on the list. Two characters are quoted more than once in multiple film appearances: "Dirty" Harry Callahan is quoted for Dirty Harry and Sudden Impact, and James Bond is quoted for Dr. No and Goldfinger. Assuming that the multiple incarnations of the T-800 are counted as a single character, then it is also quoted for two different films: The Terminator and Terminator 2: Judgment Day. Two dialogues appear on the list, from Airplane! and Top Gun (amusingly, both films from The '80s about aviation). The oldest quote is from The Jazz Singer (fittingly, the first spoken dialogue in all of film). The most recent quote is from The Lord of the Rings: The Two Towers. No animated films appear on the list, although one quote is provided by a CGI character in an otherwise live-action film. (2) Marlon Brando says "I'm gonna make him an offer he can't refuse", not "...going to...". (66) Charlton Heston says "Take your stinking paws off me, you damned dirty ape", not "Get..."
(98) Patrick Swayze says "Nobody puts Baby in the corner", not "...a corner." "Bond. James Bond."  Dr. No, etc. Striker: "Surely you can't be serious." Rumack: "I am serious...and don't call me Shirley."  Airplane!